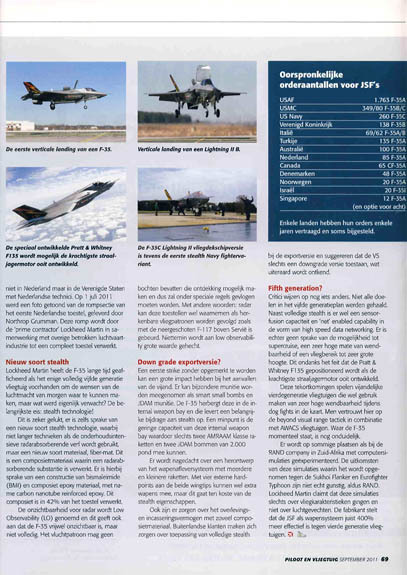 Our former status report in 'Piloot en Vliegtuig' (above) also on this site. 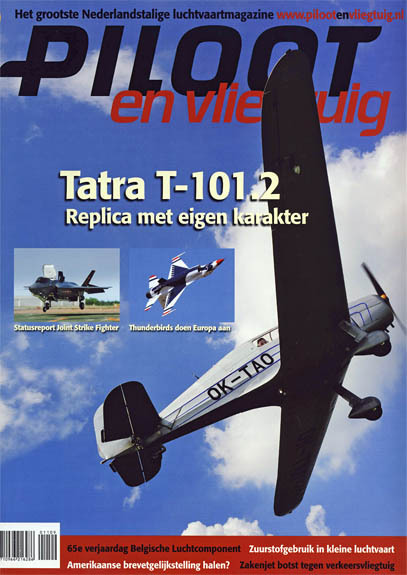 This month's magazine: The article as well as Hans Heerkens reflections part-2 ! Get a good impression of the present status, and expectations for the future. Though unlikely, you never know if a government will make a sudden unexpected choice. 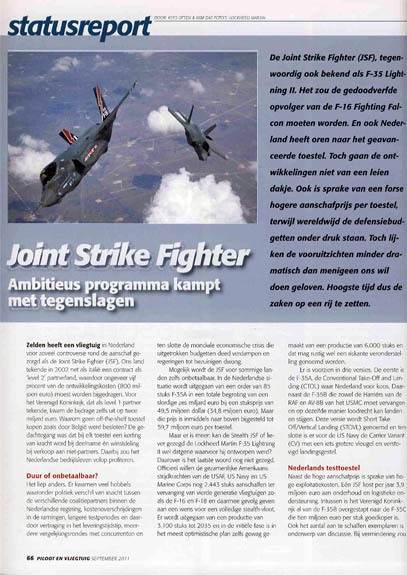 As long as the JSF is not the overall definite choice, it's all open still. Eurofighter ? Gripen ? Not to say unfortunate, ast the F-35B STOVL is grounded momentarily due to problems with the 'vertical' systems. Ofcourse testing and improving will go on, to have the F-35B land on carrier platforms. Above some details of the JSF, the engine is common for all the variuos types. 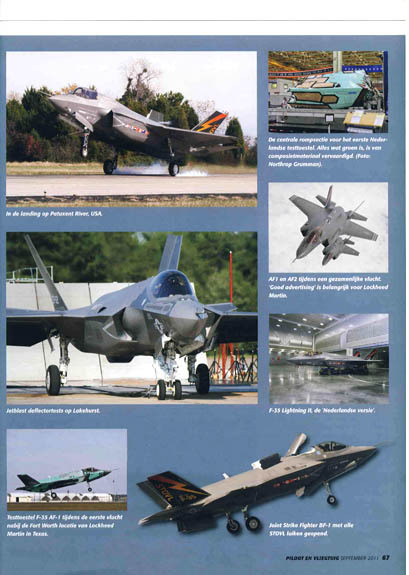 If the JSF can deliver what it is designed for, it's a 'hell of a machine' ! Much depends on the delivery time of Lockheed Martin, to avoid costly upgrades after too late (years) deliveries. In particular the development of software is dramatically behind schedule and it looks like becoming the big bottleneck. However testing and flying continues, and several clients are informed and consulted. A view of a test ramp, jet engine blasts registered by dozens of sensors. This test-pilot doesn't seem to have any problems flying the brandnew fifth generation aircraft ! Time will tell how the project goes, but in any case the U.S. Congress passes an important mark. 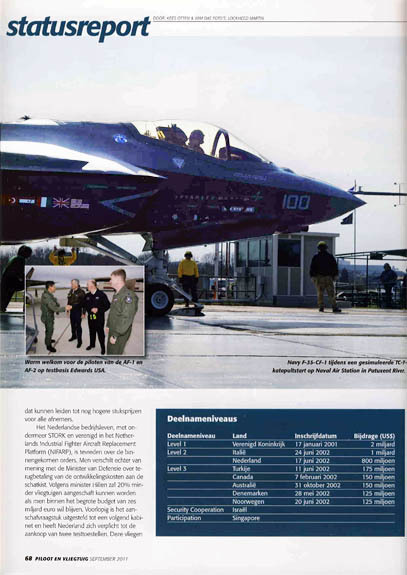 Take a close look again: It will still take some time before we can admire our roundels on JSF's over The Netherlands !